(San Diego, CA)- The first annual Rum Runner Race from Newport Beach to San Diego has now also seen the enormous potential for the J/88 in “classic” California offshore races. 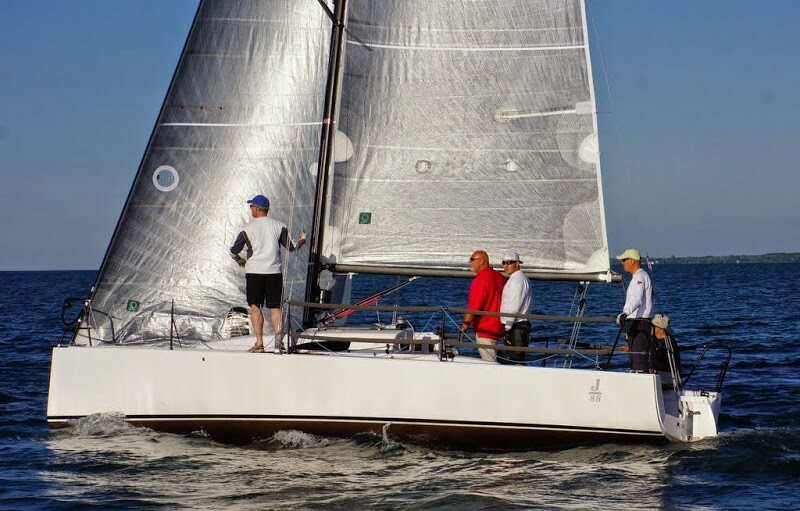 In this year’s Santa Barbara to King Harbor Race, it was the “seldom seen” J/88 CRAZY EIGHTS that not only won her class but at one point was winning overall in the last 15nm of the race. Now, with a new race and a new 75nm long course layout, the fleet of top Southern California offshore teams sailed from Newport Beach offshore to an inflatable mark stationed on “14 Mile Bank” then flew downwind to the finish line off San Diego. The race was hosted by Balboa Yacht Club and San Diego Yacht Club. In his first offshore race on the J/88, Scott Grealish’s BLUE FLASH streaked down the race course to San Diego at a 7.42 kt average to win both PHRF Division 3 as well as PHRF Overall! (Tokyo, Japan)- A quick report from Japan from Kebby Tokoro indicates that things are hopping in the Japanese offshore and one-design circuits. There is great interest in the J/70 as well as the newly introduced J/88. Kebby reports that, “we have been doing a lot of promotion for the J/88 and J/70 in Japan. Please see the fantastic review of the J/88 for KAZI magazine. Plus, we have been racing in several big fleet offshore races. 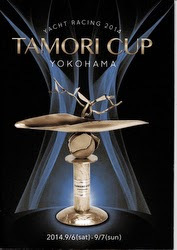 One of these events is the famous Tamori Cup, it is the biggest yacht race on the east side of Japan. We got 5th Overall and 3rd in Class! Many sailors were shocked to see how fast the boat goes, especially in lighter winds. We hoped they would do more races, but the last day was canceled due to a huge typhoon! (Chicago, IL)- An estimated 700 sailors and crew members sailed the into St. Joseph on Saturday on the first leg of this year's Tri-State Regatta. The race, which sails from Chicago to St. Joseph overnight from Friday into Saturday, from St. Joseph to Michigan City, Ind., on Sunday and from there back to Chicago on Monday, has been conducted since the 1940s. Terry Deegan, fleet vice commodore for the St. Joseph River Yacht Club, said earlier this week that 115 boats were registered for the first leg of the race. Pam Bower, one of the event organizers, said the events all day Saturday at the St. Joseph River Yacht Club will be held "rain or shine." The yacht club pool was open to the public all day. Plus, the big bonus on Saturday night was the band “P.S. Dump Your Boyfriend” that performed for everyone- for free! No wonder, Saturday in St Joe is billed as “The Best Regatta Party on the Great Lakes”! For the 50.5 mile race of Leg 1, the forecasted thunderstorms that loomed to the south never materialized over the lake for most of the night without a single drop spilled on anyone. The light show stayed onshore far to the south, but provided the sailors with a steady 14-16 kts with gusts upwards thereof. The steady southerly meant a swift race for many. The interesting, wet ride was probably on the new RAMBLER – the J/88 owned by Ben Wilson. Wilson took the lead ahead of a lot of local St. Joe talent right out of the box from Chicago. According to Rich Stearns, a crew on board, “Friday night race was 15 to 22 knots fetch which turned into a tight reach. We struggled a bit when it was really tight; we had to catch another boat’s wake for an hour. 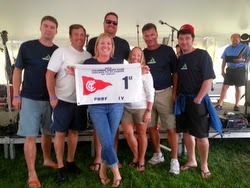 But when the wind just went back 10 degrees off we went!” They ended up winning PHRF Class 4 as a result. (Marion, MA)- The J/88 #35 “Yonder” sailed her debut race at this year’s Buzzard’s Bay Regatta, competing in a tight fleet of J105’s, 109’s and a 120 in PHRF 2. Owner Doug Newhouse (Newport, RI) was competing in his first-ever regatta and dealt with a mix of conditions, assisted by crew from Quantum Newport. Friday saw the fleet touring the Bay in a 30+ nm distance race where local knowledge came in handy. Saturday brought rain and breeze in the 10-16 kt range, giving the J/105’s just enough breeze to beat the 88 upwind despite a rating difference of 9 seconds/mile. Team Yonder was quickly getting the boat dialed-in though, with an 8-6-4 going into Sunday. (Santa Barbara, CA)- This year’s Santa Barbara to King Harbor Race did not disappoint the 90 boat fleet assembled for one of the most popular mid-summer offshore races in Southern California. The race is full of surprises and the most salient element facing the teams headed on yet another classic “downhill sleigh-ride” was the fact that all weather forecasts were wrong— thank goodness. Top dog in this year’s race for J/Teams was Dr. Laura Schlessinger’s J/88 CRAZY 88, sailing the race for its first time and convincingly winning PHRF Sprit B Class. While the “Doc” has done the race numerous times in the past (J/92, J/125, J/145), the overall and class wins have proven elusive to her team. “The start of the Santa Barbara to King Harbor race was in light air. We started down the line a bit and STAMPEDE started at the pin end in clear air. This allowed them to get in front of us while we had to fight through many other boat's dirties. The SC 37 started with us and they were able to get a bit ahead of us also. At Anacapa Island, they both had managed to get a decent lead on us. We were there with the Ross 40 which owed us time and the J-120 POLE DANCER not far behind us. We managed to get around Anacapa avoiding the holes and not wasting distance going too far outside. This race is usually windy with conventional knowledge saying to go inshore before you pass Pt. Dume. But this year was lighter than usual with more of an offshore flow. I don't think we ever saw over 13 true on the entire race. Our feeling was that Pt. Dume was going to be very light instead of the usual breezy and we should stay further offshore which matched our polars very well. We watched the fleet go inshore and it looked like they were killing us. But there was no percentage in following them so we stuck to our plan. We continued down the rhumbline or slightly inside past Pt. Dume and into Santa Monica Bay as it got dark. Santa Monica Bay started getting its usual lighter and lighter self in the evening although we were able to keep up some boat speed. About 10:30 the breeze picked up to 6-8 knots and we thought that maybe we were not going to have to spend most of the night out in the bay. We had lost sight of the boats inside in the dark and were unaware of how they were doing. Shortly after 11:00 the fog came in thick and we were seeing wind up in the nines from time to time. It was spooky seeing running lights come out of the fog and then disappear as we crossed jibes. They looked like pretty good-sized boats but it was hard to judge in the dark and fog. 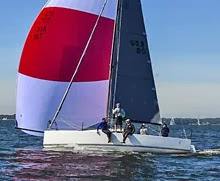 For the balance of their fleet in PHRF Sprit A, the J/133 TANGO sailed by Roy Jones took fourth and fifth in class was Joe Simpkin’s J/133 FORGIVENESS. Sixth was Tom & Terri Manok’s J/120 POLE DANCER. Taking 2nd in PHRF B Spinnaker class was the J/33 TIGGER skippered by Fred Cottrell from King Harbor YC. In the Sprit ULDB A Class, the J/125s clearly had a split-decision on how to approach the race. One boat went high off the start matching the J/145 and Bernie Girod’s ROCK’N’ROLL (a Farr 400 reverse-bow special, an ex-J/105 owner), the other went low of rhumb. In the end, Mark Surber’s DERIVATIVE got the better of Viggo Torbenson’s TIMESHAVER by a mere 30 seconds at the finish line after 80nm!! They took 3rd and 4th in class. 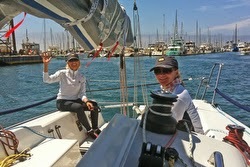 Carolyn Parks’ J/145 RADIO FLYER finished just 20 seconds behind her J/125 colleagues, taking 6th in class. Finally, in the PHRF B Sprit Division, Dr Laura Schlessinger’s new J/88 CRAZY 88 took class honors by nearly 20 minutes on corrected time. Taking 3rd was Jack Mayer’s J/109 ZEPHYR, 4th was Tom Bollay’s J/105 ARMIDA and 5th was Bryce Benjamin’s J/109 PERSISTENCE. “The forecast for this year’s Santa Barbara to King Harbor 80nm race was a bit challenging, if not forbidding, for the 90 entries in this year’s race. In fact, the weather forecast created a somewhat gloomy outlook on what is regarded as one of the best mid-summer offshore races all year long on the Southern California sailing calendar. There was talk amongst a number of crews on the smaller boats that if Anacapa Island was not reached by sunset, it was perhaps time to consider the “iron genny” option and simply head for home. For veterans of 20+ SB-KH races, the prospect of rounding in the lee of Anacapa at night (which can be either a 30 minute scenic tour or 3 1/2 hours of drifting hell) was not to be taken lightly. What this scenario could lead to was sailing’s version of torture- a mind-numbing exercise of staring at sails and red-lit instruments far too long, fueled by too much Red Bull, leading to hallucinations of “heffalumps & woozles” (pink & green Dr Seuss elephants) crossing the horizon in front of you due to lack of sleep for 24+ hours. In other words, drifting across Santa Barbara Channel to Point Dume that would lead to drifting across Santa Monica Bay in 0-3 kt whispers of wind towards the towering cape of Palos Verdes that might take until noon the next day! Sailing a proverbial “glass out” all night long was not appealing to many. While most years the starts can often have light airs for the first few miles headed to Anacapa Island about 25nm offshore at a 140 degree course, the breeze often picks up quickly and with 15nm or so to go to that first turning mark, winds seem to have a habit of whistling down the northern side of Santa Cruz Island and blow from 15 to 20 kts and, in some instances, 20-30 kts! Conventional wisdom for the race seems to be sail rhumbline to Anacapa, then choose an “inshore” course in the island’s lee if light or an “offshore” course (1-2nm) if breezy. Once clear of the island, shoot straight across to Pt Dume on port tack for 32nm at 80 degrees, gybe once onto starboard, then head straight for King Harbor for 22nm at 100 degrees. There are some variations on the strategies, of course, like head right towards KH after rounding Anacapa, or gybe back in under Pt Dume to Malibu for localized “point acceleration” of the breeze, or simply gybe on the lifts from Pt Dume to KH for 22nm and hope no one in either corner (LAX Airport beach to the East or Catalina Island wind bend to the South) blows past you. This year’s sleigh-ride was on-board Dr Laura’s latest rocketship, the J/88 she named “CRAZY 88”. For many of you not “in the know” about some of SoCal’s cast of characters that sail offshore, Dr Laura may be one of the most interesting and enigmatic personalities of the California offshore fraternity. While renowned on public talk-show radio to millions of her fans across America as simply “Dr Laura” (http://www.drlaura.com), helping listeners on the trials and tribulations of their daily lives for over 40 years, sailors in SoCal simply know her as “Doc”. Doc has learned to love sailing as an outlet for her competitive drive- for her it’s therapy. It’s the thrill of sailing as a team member with a good crew and her passion to succeed combined with her fierce determination enables her to drive for hours on end at a remarkably high level. For many who know her, perhaps it was that amazing shot of Doc’s 47 ft KATANA blasting down the Molokai Channel that epitomizes her will to win— for 8 days Doc steered from dawn to dusk and while blasting towards the Diamond Head finish line doing 27+ kts down a 15 ft wave, the bow dug in and cast a comber across the decks that washed out her feet at the wheel! Not only did she not let go, she kept driving to the finish, all 105 lbs of her! 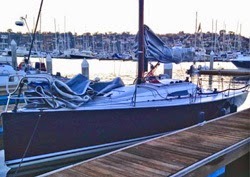 Given the fact that her offshore skills have been strongly tested in big boats (J/145, J/125, Kernan 47, etc), Doc was looking forward to sailing her tiller-steered J/88 in its first SB-KH Race. Amazingly enough, she was worried that the boat might not be big enough, and fast enough, to finish by midnight (I think she was worried she might turn into a pumpkin and have to go to sleep!). Nevertheless, as her crew assembled before the start of the race (Wendell Liljedahl, Sam Solhaug, Julia Langford & Stu J) on the Santa Barbara YC docks, it was apparent the various weather models might be a bit “off”. Prior to the start, every forecast (NOAA NAM/GFS, Sailflow’s proprietary models, Europe’s ECMWF, and even Clearpoint Weather’s highly accurate 1nm/ 5nm models (http://www.clearpointweather.com) was showing a “micro-Low” forming over the Channel Islands early Friday Am and moving south-southeast and consuming all winds in the area like a giant vacuum cleaner (despite showing very strong offshore flows from the Pacific High just 15-20nm offshore). Based on those forecasts, some boats even dropped out beforehand. Nevertheless, the majority of the fleet headed off into the unknown, prepared to sail like lemmings into the abyss (the starting line) towards Anacapa and into the proverbial Twilight Zone (the gap in the Channel Islands formed between the enormous Santa Cruz Island and Anacapa Island itself). 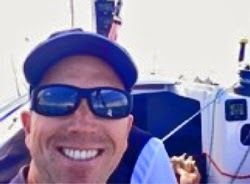 Like clockwork, Santa Barbara YC’s RC/ Sailing Director Brad Schaupeter fired off the warning signal at 1155 hrs. The big boats were the first to take off in very light airs at 1200 hrs sharp, at most 2-4 kts from the SW, the conditions were nowhere near the forecasts. Why? Friday dawned with a blanket of cool fog that completely enshrouded the Channel Islands, a scenario that often permits the prevailing NNW offshore breezes to permeate inshore and create a WNW flow down the coastline. By the time that Doc’s J/88 CRAZY 88 took off at 12:15 pm, the winds had not changed much, necessitating the use of the LM1 jib for maneuvering at the start with a Code Zero ready to roll. A Beneteau 40.7 was in our midst on the wrong side of the starting line yelling “starboard” at everyone (they were supposed to be on the “left” side). Such is life sailing PHRF. With a great start near the starboard pin, Doc focused hard to sail fast and maintain clear air. Less than 5nm after the start, the breeze kept accelerating in velocity from the WSW and we managed to lead our class boat-for-boat for about an hour. Soon, one of the primary competitors that was clawing well to windward of rhumbline, a Tartan 101 called Mistral, set their Code Zero and rolled over us before we set our own C0 flying. Nevertheless, after another hour of sailing in a very slowly building westerly, they faded off into seeming oblivion to leeward, at one point bearing 90 degrees to leeward of us while we sailed with a C0 and staysail at 110 TWA doing 6.5kts in just 7.0kts TWS— an apparent wind machine the J/88 is! Fast forward to the approach into the Anacapa turning point, Doc was sailing fast. So far, so good on relative fleet position. All things were good on crew comfort, especially Doc’s homemade PB&J’s (peanut butter and jelly sandwiches for the uninitiated) using potato bread— the best combo ever! Lunch included tasty “Food That Tastes So Good” sweet potato tortilla chips! Wow, combined with the salt-air surrounding us, nothing ever tasted so good with Gatorade! Meanwhile, the Mistral boys way off to leeward practicing the “zero-to-hero” strategy looked like their gamble might pay off. Unusually, the breeze did not keep accelerating on the approaches to the Anacapa turning point, puffs never seemed to climb above 15 kts TWS. It was fantastic conditions for the J/88 as with our A1 chute and staysail flying we were surfing off wave-tops at up to 10-12 kts consistently and giving the J/120 headaches just in front of us. The “high road” fleet of boats that included the J/105s, J/109s and a host of others in class were feeling the effects of having to bear off using A1/ A2 kites with lower AWS/ AWA and, therefore, much lower relative boatspeeds. By the time CRAZY 88 hit the Anacapa left turn, Mistral planed across in front of us and was ahead by at least a mile and we were still in the hunt, we hoped, for a top three position in class. While a number of boats around us turned left in under the lee of the island fairly quickly, we rode a long 13-15 kt wind streak about a half-mile past the island before gybing. 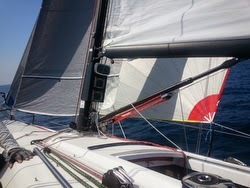 We’d set the A2 “whomper”, a giant PHRF maxi-size chute, and were flying downwind on a favorable headed starboard shift. Once on the other side of the streak, we gybed in the lift and rode it for at least 2-3nm down the backside of the spectacular cliffs of Anacapa before having to head up and maintain speed to “shoot the gap” between the two massive rocks that form Anacapa island. By this stage, we caught the J/120 POLE DANCER and the 1D35 DEJA VU, both inshore under the island in no wind. As the breeze filled beneath the gap in the island, those two took off. Since we were outside of them, we then settled into a pure VMC/ VMG course scenario keeping the big A2 Max full with staysail flying at around 145 TWA and steadily flying down the large Pacific swells at 8-9.5 kts in a wind that varied from 8-13 kts TWS. We basically felt like we were on a skateboard zipping down the swells and placing the bow where it felt best and fastest. Doc was in the back with a big smile on her face simply enjoying the ride. And so it went for the next 30 odd miles to Pt Dume. The J/120 ultimately pulled away and a bit to leeward by a mile or so. So did the 1D35. That was our world until the fog settled in near Pt Dume. Approaching Pt Dume at dusk, we took one gybe onto starboard and headed back across Santa Monica Bay. We lost track of the blue chute flying on Mistral, we last saw them going left into Malibu and perhaps the beaches of Santa Monica. We decided to simply sail a fast angle of 130 to 150 degree TWA with our big A2 asym until the wind started to die (we ultimately changed down to the A1), and steered 110-135 degrees on starboard towards King Harbor, playing the shifts along the way (our port gybe angles varied from 40-65 degrees). About 8nm down track to the finish (just 14nm left), we crossed ahead of the 1D35 and just astern of the J/120. Five more gybes on 10-15 degree shifts in 7-12 kts TWS over the ensuing hour and we had put the 1D35 and the J/120 astern of us. The last time we saw these two boats, they were heading off to the south, staying on starboard gybe towards Catalina Island (perhaps waiting for a miracle breeze channeling between the island and Palos Verdes peninsula). The fog was dense enough that all forms of reference from a steering perspective were literally gone. Toss in a quartering swell. No horizon. No sky. No moon. No stars. Yes, a “detox, de-sense chamber” in real life— better than anything imagined by any NSA/ CIA interrogation unit! Just a blanket of darkness enshrouding the boat and only the gloom of the bow lights on the chute and the glow of the red-lit instruments guiding you. Disorientation was easy. Next step was a descent into the darkness of Dostoyevskyian madness! To say that Doc had never been “instrument-rated” may be a bit of an understatement, she had done little steering at night offshore despite years of sailing (remember? Her M.O. was sunrise-to-sunset). Many of you that have done offshore races know that feeling of “hallucinatory tricks” that both your eyes and mind can play on you— a result of physical fatigue as well as intense concentration. Mental relaxation can often help you overcome such situations. Focusing on just steering a basic compass course, Doc managed to lock into a “fast, comfort” mode that was loosely based on the fastest TWA of around 135-145. That is how Doc and the crew rolled all the way into the finish line. The further we clawed our way down towards the finish line at KH, the more the wind kept dropping and the more we kept passing boats that simply lost all ability to keep sailing good VMC/ VMG angles with their spinnakers (many twice our size). Throwing in five gybes in the last two miles, we finally clawed our way around the white flashing light at the harbor entrance, doused the A1 and finished under the LM1 jib not having any idea of how we did. We presumed the worst, of course, because there was no way to track what happened to anyone else. Doc was elated but somewhat subdued. Glad to have finished the race around 2am, but clearly exhausted. So were the rest of the crew. Wendell having trimmed the chute for most of the 14 hours. Sam and Julia for having executed about 40 gybes nearly flawlessly (no joke, we lost count after 25 gybes) and Stu for frying a few thousand tactical brain circuits along the way. It was an amazing effort. And, it’s fair to say that Doc quickly achieved her “IFR” (instrument-rating) certification in offshore racing! As we departed KHYC around 2:30am Saturday morning, we discovered that we’d won our class, boat-for-boat and on handicap. Doc’s response? “Thank God, Lew (her husband) won’t kill me now!” she said cracking a smile. Though her husband Lew doesn’t sail, he supports her passion for sailing with friends and is always happy to know the effort was worthwhile and the crew made it home safely. (Hamble, England)- The J/88 is celebrating its first win at a British regatta! The J-Cup in Partnership with B&G, an event held annually exclusively for boats of the J/Boats brand, took place from 24th– 26th July hosted by the Royal Southern Yacht Club, Hamble. Amongst the outstanding number of 65 entries, organizers were excited to see four J/88s entered, a model that only landed in the UK towards the end of last year. 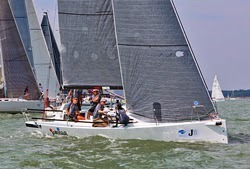 The J/88 teams raced in an IRC 2 class with two J/92s. The winner after seven races was JONGLEUR, owned by Stewart Hawthorn. Stewart is a long-time J/Boats sailor, having previously enjoyed many victories in his previous boat a J/80. JONGLEUR scored an incredible six wins and discarded one second place to take the IRC 2 Class title. In a regatta where nearly every race focused on seeking breeze, this was a superb result. “We worked our way round the strategy that we had set ourselves – to make nice clean starts, get in to a good lane, then watch what was happening,” said Stewart. “The last race of the series was the highpoint I think as we managed to come from a really flaky start, being well down the fleet on the first beat, and from that get in to the lead. Very difficult and tricky conditions for everyone, but having sailed in the Solent for a number of years it wasn’t too much of a shock,” he added. (Youngstown, NY)- The inaugural J/88 Great Lakes Championship took place last weekend concurrent with the CanAm Challenge Regatta hosed by Youngstown YC in Youngstown, New York. The 88s enjoyed excellent competition over the weekend and the regatta PRO managed to knock out five races for the fleet. On the first day of racing, it was evident the fleet had a two-tiered competition going on. Leading after the first day by one point was Joe Pawlowski’s CRAZY EIGHTS with a 1-2-1 record for 4 pts. Just behind was Jim Egloff’s SEAWEED with a 2-1-2 for 5 pts. 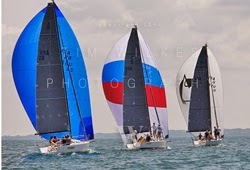 Then, the next three boats kept trading places with one another in very tight racing with Richard Lohr’s NIGHT OWL leading this trio followed by Joe O’Brien’s SQUIRMY and John Frank’s RUMBLE BEE. Sunday’s racing saw even more jumbling of the fleet in the two races that were sailed. While the SEAWEED crew finally got it all together and produced two bullets in a row to win the regatta with just 7 pts, behind them other teams were quick learners on extracting more boatspeed as well as sailing better tactics. In the fourth race, CRAZY EIGHTS was 2nd followed by SQUIRMY in 3rd. Then, in the last race, NIGHT OWL was 2nd and CRAZY EIGHTS took 3rd. On an overall basis, with SEAWEED’s Jim Egloff declared the first J/88 Great Lakes Champion, second was Pawlowski’s CRAZY EIGHTS and taking third was Lohr’s NIGHT OWL. C&C 30 vs J/88: There are obvious similarities between these two new boats but also some key differences. In most cases a sailor will begin by looking at both and then rather quickly decide that one is a better fit for them than the other. One of our tasks here is to help in that process. Similarities: Both are modern designs geared to performance and close in length, the C&C being 30’ LOA and the J/88 29’. They both have an inboard diesel saildrive with folding prop. 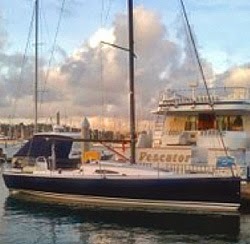 Each has a Hall spars twin spreader carbon mast and aluminum boom, and Hall standing and running rigging packages. Each is built with modern resin infusion cored construction in the hull and deck. The base prices of both boats are almost exactly the same. Both have all the ballast in the keel bulb. They are each built in RI in plants less than 10 miles apart by experienced sailboat builders. Both have minimum overlap headsails and asymmetric spinnakers set on sprits. Other similarities include LED lighting, long clean cockpits with open transoms, two settee berths with cushions and the option for two more berths (V berth in the J, quarterberths in the C&C), standard race hardware and spinnaker rigging including vang, Cunningham, adjustable backstay(s), etc. Due to similar size and pricing there will naturally be some comparison shopping. Finally both are sold through dealer networks which broaden distribution and create the option for taking trades, provides local servicing and demo sailing availability, etc. Differences: It does not take too long before one realizes that despite the many areas where the two designs are similar, there are also plenty of differences. The result is that the two boats are aimed at somewhat different markets. While both are performance boats that will be used a lot for racing, the C&C is decidedly more “racy” and the J has much more interior and seats in the cockpit. We will go out on a limb and state that the age of the typical C&C 30 buyer will probably be younger than the bulk of the J/88 buyers. Rudder: C&C is inboard, J is outboard, but each is easily removed. Sprit: Both carbon by Hall. 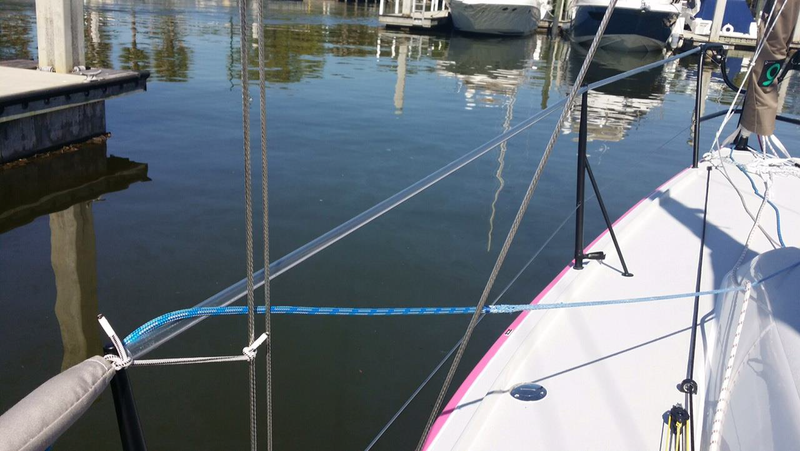 C&C has a tapered sprit that is fixed while sailing but is easily removable at the dock. The J/88 has the typical retractable sprit common on other J models. Keel: C&C has a carbon fiber fin with a T-bulb made of lead, finished in white epoxy paint. The J/88 keel has a J-shaped fiberglass fin around a stainless steel backbone with all the lead in bulb. It is finished in smooth white gelcoat. 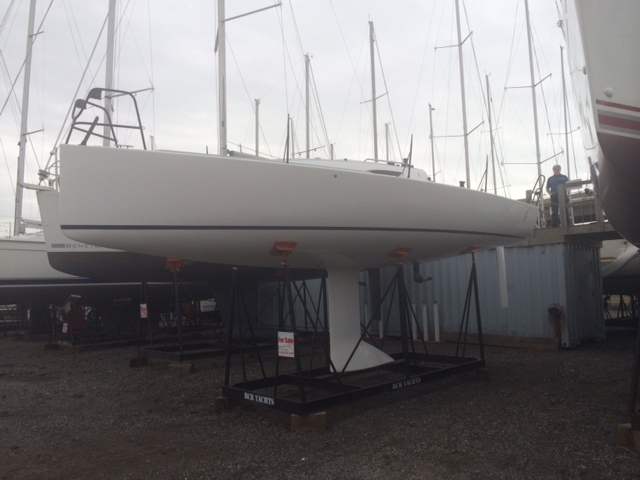 The J/88 keel is fixed, the C&C partially retracts to reduce height for trailing. Design: Marks Mills did the C&C and Al & Rod Johnstone drew the J/88. Dimensions: The C&C is a bit longer, a bit wider, a bit longer on the waterline and has a foot more draft. Weight: The C&C is 1,100 pounds lighter with almost the same ballast as the J/88. Sail area: is greater on the C&C with all three sails being larger. Engine: The C&C has a 12 HP Volvo, the J a 14HP Yanmar, both saildrives with folding props. Tiller: Carbon fiber on the C&C and Molded Fiberglass on the J, both have extensions. Core: The C&C uses foam core in hull and deck, the J balsa in the hull and foam in the deck. Mast Step: Keel step on the C&C adjusted by turnbuckle, fixed tabernacle on the deck for the J.
Forestay: C&C has Dyneema forestay for hanked on jib, J/88 has a below deck Harken furler. Backstay: Both Dyneema; C&C has twin 2:1 backstays led to winches aft. J/88 has single with cascading double-ended tackle. Head: the C&C has a small self-contained unit, with the option for a head with holding tank. The J/88 has a standard marine head with holding tank. Winches: C&C has 2 for sheets, 2 for backstays; J/88 has 2 cabintop and 2 sheet winches in cockpit. 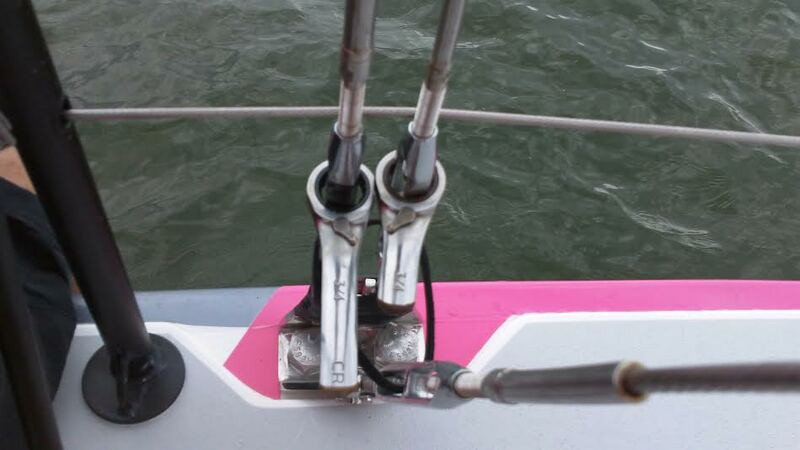 Jib leads: C&C has all-axis lead adjustment led under deck, J/88 has adjustable Harken tracks. Vang: 16:1 Spectra on the C&C, Hall rigid Quick Vang on the J. Forward hatch: Offset round on the C&C, centerline square on the J. Main Companionway hatch: C&C’s is offset, centerline on the J. Sink: none on the C&C, standard on the J.
Cooler: none on the C&C, standard on the J.
Deck: The C&C has a flush deck with no coachroof or side ports but one aft facing port into the cockpit. The J has a cabintop with two fixed side ports and optional aft ports into the cockpit. Interior: Here is where the boats differ considerably. The C&C is more Spartan and open from front to back. It has decidedly less headroom. The forward area is open but there is a lot of area aft on either side and plenty of space for the optional quarterberths. The head is a very small self-contained plastic unit that pumps out through the deck. Leave your modesty at the dock. The J has a more conventional interior with headroom to walk bent over and a sizable bulkhead between the head and the main cabin plus a curtain so there is some basic privacy. The V berth is an option that is almost always ordered. There is storage behind the main cabin backrests, some cubbies and shelves, a mini chart table to starboard and sink area to port. Under the cockpit there is plenty of storage with access through one seat locker. You could cruise the J if you are realistic about the limitations of space in a 4,900 lb 29 foot performance boat where weight is a consideration. The berths are plenty large and it is not claustrophobic below. Colors: both have standard white hulls with choice of waterline colors and optional 2 tone decks. Each also offers the option of black powder-coating on the standard rails and stanchions (really sharp). Hull colors other than white are only available by painting after construction. Spars are black. Well? Both boats will appeal primarily to racers but can certainly be daysailed and slept on overnight. The C&C is clearly more of a Grand Prix hotrod but the J is no slouch. The J is better suited if you plan to spend any time below. Both are capable of overnight races, unlike some other boats that are really inshore day-racers. The quality of both is excellent in our opinion, the C&C being more high-tech, the J having more amenities, cockpit seats, and storage. 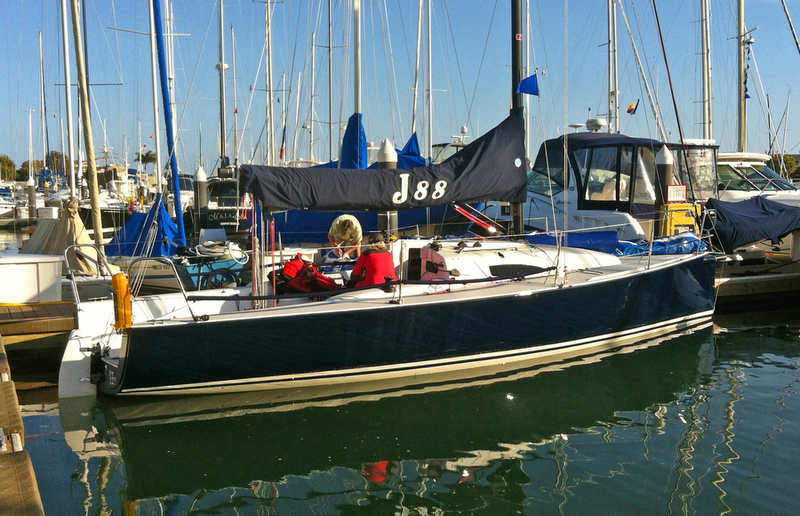 We have been sailing the J/88 and really enjoying it and the owners love their boats. We have yet to sail the C&C and can’t wait; the initial reports from very good sailors have been glowing. Since I have not sailed the boat yet we can only comment on what we have seen during construction. I was able to follow the build on several trips to the factory in RI. This allowed me to see the construction process from the very beginning when it was just some lines on paper to the almost-finished boat that was a couple of days from being launched. It also gave me the opportunity to speak to the guys building this rocket so they could explain what they were doing and why. The one feeling I can say has stayed with me right from the beginning is the obvious quality and attention to detail that these guys have put into the C&C 30 One Design. It is really, really well made and finished. The factory where the NEW C&Cs are being built is the one where thousands of Jboats, Alerions, True Norths, and various other boats were built over these many years. The depth of talent and experience in that building is considerable and is rarely found elsewhere. The new owners of US Watercraft have opened their pocketbooks to bring in some truly skilled engineers, boatbuilders, architects and supervision to add to the team already in place. Despite all the other projects underway there they have put forth what is clearly a labor of love with the C&C 30. Dealers and builders are alike in that we make our money selling cruising boats but we get our kicks out of building and selling race boats. The guys at USW clearly enjoyed creating the C&C 30. When we talk about the obvious quality of construction of the C&C 30 we are not speaking of gloss varnished hand crafted interior joinery, although USW is very capable of that in their other products. Instead they take great care during the construction of the hull and deck so that the parts are at minimum weight and maximum consistency. Everything they put into hull #1 was weighed to make sure they are hitting their numbers. This is a high performance boat so what is there suits that purpose and there is nothing that is not needed. Being near the yachting Mecca of Newport has the added benefit of a wealth of world-class sailing talent who happen to be friends of the USW folks. These rock stars have been all over the C&C 30 providing invaluable input on the deck layout, hardware and rigging placement, etc. So the boat is not only very carefully and skillfully made, it is also set up with the advice of the best brains in the game today. The same people sailing and tweaking TP52s and Volvo 70s have provided counsel on how to set up the C&C 30 for maximum sailing efficiency. This relates to the way the sails are trimmed, crew ergonomics, reduction in unnecessary weight and complexity, and so forth. When you are building an all-new boat as opposed to an update of an older one you are not constrained by the limitations of the prior design or tooling. Since the C&C 30 is a clean-sheet design being mother-henned by guys that know a ton about building race boats (i.e. Farr 30s and 40s, etc), they can do a lot of cool things. I noted for instance that under the angle brace feet of the lifeline stanchions they have round carbon pads that not only look awesome but spread the load. The gloss-finished carbon tiller is a work of art, with the new colored C&C logo molded in. The jib sheet adjusters are led under deck which further reduces clutter on a really clean deck. There is an angled molded FRP pedestal on the cockpit sole where all the mainsail control lines are conveniently located for the main trimmer. The sprit is a round tapered carbon spar that slides into a centerline socket at the stem. Once in place it is secured by a Spectra line that is cleated inside the hull. For docking or transport it can be easily slid back out. 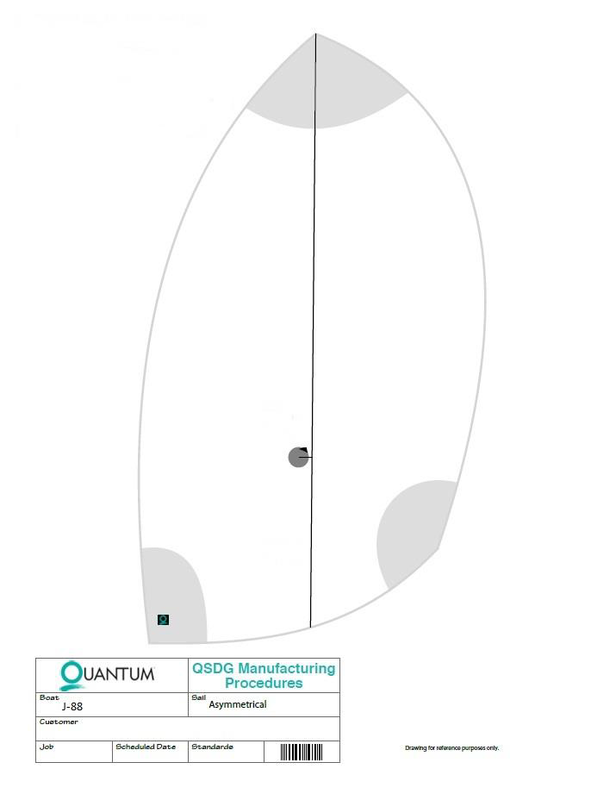 The foils are made right at USW, the keel is a carbon fin with a lead T-bulb and the rudder made of E glass with variable density foam and Vinylester resin. The keel box inside the hull is very solidly made with carefully machined synthetic bearings (I forget the name the engineer had for them) that give the keel a nice tight fit, no rattling around. The keel is designed to be raised for transport to reduce the air draft of the boat on the trailer. There is an inspection port in the deck over the keel for a single point lift through the deck. The keel does not come through the deck. The rudder may be left in during transport or easily removed and stowed inside the boat. The spars and standing and running rigging are made nearby at Hall Spars and rigging, and again the close proximity to the USW plant makes it easy for exchange of information during the prototype process. It is much easier for those designing and manufacturing components to be able to see the boat in person, sail on it, and meet face to face regularly with the boatbuilders and engineers. And all of this is built in the USA! We had been asking Jboats for a new model in the 28-30 foot range for a number of years. The 33 foot J/100 was an excellent boat for us and for our customers, but it was a bit larger than what we needed and the price crept up. Further, it was never intended as a racing boat despite the fact that all of our customers (and ourselves) raced our 100s. We asked for a new model that was a bit smaller yet faster for its size, being confident that it would be a hit. The Johnstones listened and so the 29’ J/88 was born in 2013. Because we were such vocal proponents we were promised and received hull #2 late last July. This gave us an opportunity to sail the boat and take orders before most other dealers, with the result that we now have five J/88s sailing here on the Lower Niagara River. This is supposed to be about the build of the boat so let’s start with who builds it and where. 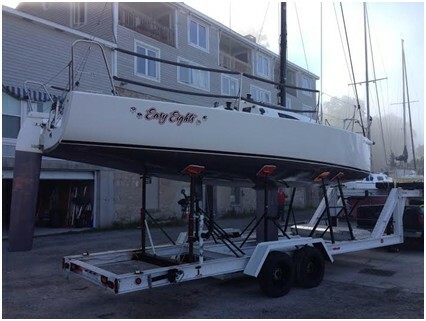 CCF is located in Bristol, RI, in close proximity to a number of other marine industries including Hall Spars. The plant is modern and clean and the owner and his loyal workforce will never be seen standing around. They currently build various Jboats models including the 70, 88, 95 and 111, along with others including their own line of North Coast power boats. When we began to sell J/70s like hotcakes (we are up to about 30 boats sold here so far at RCR) I admit I was a bit nervous because when you are selling that many boats you worry about the potential warranty and service obligations. However, the boats we have gotten from CCF so far have been close to trouble-free, including all those 70s and several 111s. The CCF folks produce boats of consistent quality and their on-time completion record is excellent. They don’t offer many options and they don’t get into fancy woodwork, they specialize in fiberglass lamination and resin infusion. We can honestly say that we have been impressed with the boats they have shipped to us and they are super to work with. CCF uses fiberglass materials that are pre-cut in the form of kits when they arrive, so each hull or deck gets exactly the same material for use in lay-up. The hulls and decks are infused which results in high glass to resin ratios and a high-quality and stronger, light weight part. The gelcoat finish on the boats we have gotten from them is also consistently good without the cracks and chips we see on many other boats. Only a couple of tiny air voids on all the boats so far. Spars for the J/88s are made around the corner at Hall Spars and Rigging. This includes a black-painted double swept-spreader carbon mast and aluminum boom. The sprit is carbon and retracts into the hull as on most new Jboat models of the last 20+ years. Standing rigging is by Hall, as is the low stretch running rigging package which is extensive and all color-coded. Standard rigging includes: two spinnaker sheets, three halyards, tack line, pole control line, jib sheets, in-haulers, adjustable jib cars, cascading backstay trimmed P&S, traveler controlled P&S, coarse and fine mainsheet tackles, Cunningham, internal outhaul, reef line, jib furling line, and probably something else I have missed. A Harken below-deck jib furler is standard as is a Hall Quick Vang. The masthead crane is longer to accommodate the square head mainsail. The rudder is outboard transom-hung and very deep for lots of control. The tiller is molded fiberglass and a telescoping Spinlock extension is standard. There is zero external teak to take care of! The keel is built around a stainless steel fabricated backbone with all the lead ballast molded around the bottom. This puts the entire lead casting inside the bulb for maximum leverage. The keel itself is made from two molded fiberglass skins, much the same as rudders are built, with the backbone and lead inside. So the outside of the keel is finished in smooth white gelcoat which will reduce maintenance. The bulb is swept aft so this is known as a J shaped keel, not a T keel, so there is no part of the bulb protruding forward of the vertical leading edge. One of the design concepts behind the J/88 was that it should be practical for a variety of uses, not simply racing. So on deck you will find an anchor locker forward, an opening cockpit seat on the port side, and P&S seats in the forward end of the cockpit with some low backrests. Daysailing and limited cruising is very much in the realm of the J/88. The traveler and mainsheet are set up so that you could single hand the boat, the helmsman could trim the main, or you can have a dedicated main trimmer. The jib tacks very easily so usually one person can do that job alone. There is plenty of room aft of the traveler to move about the cockpit. The non-skid is aggressive which we personally like, and the side decks aft of the shrouds are clear of toerails for comfortable hiking (if there is such a thing). Adding to the comfort of the crew on the rail, the lower lifeline is a bit lower, not evenly spaced us usual, so there is more room to move your torso over it and under the upper lifeline. The stanchions have welded on angle braces and are very sturdy for grabbing onto. Our guilty pleasure is the black powder coated stanchion and rail option which is not cheap but the cool factor is awesome! Due to the multi-purpose nature of the J/88 it has a usable interior. The headroom is not full standing for us tall guys but you can move around without difficulty. One day we were below waiting for the launch and there were four big guys sitting in the salon and it was very comfortable, no problem with your head fitting under the side decks and there are molded backrests behind the settees with shelves above. There are stowage cubbies in the backrests, and small cabinets P&S forward of the settees. To starboard is the electrical panel outboard of a little nav area with opening top locker and another locker below. To port there is a sink, and lockers outboard and below. Table? Who needs a table? You won’t find one. There are two fixed ports so you can see outside and you will want the two small opening ports in the aft face of the coachroof facing into the cockpit, an option ordered on all the boats we have taken so far. The main cabin bulkhead if fiberglass finished in white gelcoat and separates the main cabin from the forward part of the boat. There is a curtain that is included as standard but we don’t use it. The head is tucked outboard to port so there is some privacy without it. The head is a real marine head with holding tank and there is storage outboard. Opposite the head is a stowage area for bags and the like. The forward end of the boat comes with a molded fiberglass berth top to which you can optional V berth cushions (so far everyone has done so). Under the cockpit is where we stow loose gear, there is quite a bit of room back there. The engine is a 14HP Yanmar diesel saildrive with a geared folding prop. It is more power than the boat needs but it is nice to be able to go fast when you want to. If you are not familiar with saildrives you will be pleased with the lack of vibration, no worry about stuffing box leaks, no shaft to align, and the prop is far forward of the rudder to cut down on cavitation. Because there is no angled shaft the engine sits level which is better for the oil circulation. The engine starts instantly and is miserly on fuel. A super set-up all around. How does it sail? That is never easy to quantify in words which is why we always encourage you to come and see for yourself. Stability is good both laterally and directionally. The rudder has lots of bite. Visibility forward is very good due to the low coachroof and non-overlapping jib. 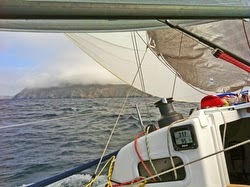 Once that big kite is up the visibility is not as good, true of all a-sail boats, especially those with lower freeboard. The boat seems to cut through waves well and behaves upwind and down. One pleasant surprise we discovered was how well the J/88 sails with only the main or jib up. The balance is excellent and the helm light. With just the main up you can’t sail quite as close to the wind obviously but the boats steers and handles just fine and the speed is pretty darn good. Nice for single handed daysailing. The PHRF rating in most areas is 87, so that gives you a yardstick of relative performance. The Johnstones have had a most successful program for years, basing new designs on their own experience as sailors, listening to customers and dealers, and using local RI build talent and suppliers. The J/88 is not a revolutionary product but it was not intended to be. It shares the same thinking as their excellent J/111 and J/70 designs which have proven to be successful in terms of sales and on the race course. There is a need for a good modern boat in this size and price range utilizing the design and construction expertise that they have refined over the years. 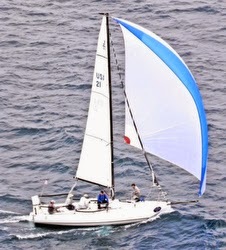 It is a versatile boat that you can race, daysail, short-handed sail and cruise for short periods. Our own feeling after sailing the boat since last summer is they have hit on another winner. And it is built in the USA! degrees. 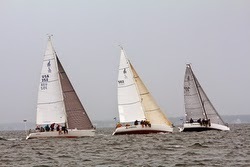 The dual 88′s and a Farr 38 started during a pin, a inshore end. WOW a 2 88′s only took off. finish. Fog will disorient people. have it we got a good change to taunt in. Championship in NCAA Men’s Volleyball! J/88s on Long Island Sound sailing full tilt! The weather forecast for this year’s N2E had a lot of promise, but with a few wrinkles thrown into the mix. For several days, many models showed an unusual micro-low ( a mini-me of a cyclone) circulating just offshore of Los Angeles, producing breezes in the southerly quadrant. The big question was how long would it last on Friday morning before the start, how strong the wind would be from the SSE and how quickly would it dissipate when the huge depression from the NW rolled in with the promised gales offshore and 15-25 kts winds along the coast. As one might imagine, whatever was forecast was going to be completely wrong. Indeed it was off by at least 50%. The basic scenario played out but not like what many experienced navigators on SoCal races expected. 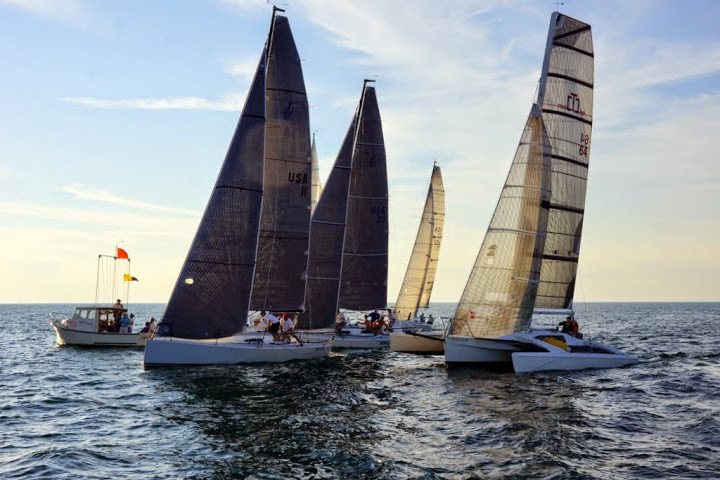 With the wx report models all over the place, it was creating a certain amount of anxiety for many of the top boats as well as ourselves on the debut offshore race for the J/88 CRAZY EIGHTS- Dr Laura Schlessinger’s latest wild ride for West Coast racing. What happened. On the way to the starting area, the weather was spectacular, southerly breezes with sunny, clear skies and puffy white clouds scudding across the horizon. At our start around noon-time, the breeze continued to pick up from the SSE (125-130 degrees or so). The micro low just offshore produced 10-17 kt SSE winds for the first 5 hrs of the race. Most of the fleet (95% of them) took off on port tack, anticipating the new frontal shift moving into the WNW quadrants in the mid-afternoon. As the fleet pounded to windward in a huge swell with wind-driven chop on top, it was clear that many boats were anxious to get onto starboard tack and head down the coast. By mid-afternoon, many boats were tacking when the breeze was still around 145-150, still left of the “closest tack angle” to the finish line (we never saw those boats again). The forecasted gradual shift never happened, the wind died completely early evening with huge NW swell generated by the incoming front with an overlay of southerly chop making for a “washing machine” effect. The whole fleet stopped, particularly inshore boats. It seems the smart money was to go offshore until the wind direction hit 150-155 degrees, going from port tack favored VMC to the finish at Ensenada (bearing about 148 degrees) over to the newly favored starboard tack. While most of the fleet tacked far too early, we waited until TWD was around 155. After we tacked CRAZY EIGHTS, it was very clear inshore boats had much less wind. 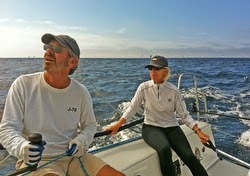 In the 88, we were rolling fast 35-40 footers inshore of us. For the next 3-4 hours, we simply sailed higher and faster than the majority of the fleet, the outside boats were getting the new, veering breeze much earlier and far longer than boats inside. On the inside boats we could identify we were gaining 5-10 deg per hour. The new breeze line coming in from 230-240 didn’t appear to migrate inshore. After 5-6 hours of sailing hard on wind, the wind died on the whole fleet late afternoon (at least those boats we could see on the horizon). For the next hour or more, it was sailing zephyr to zephyr and we were going back and forth with a well sailed FT10 and a Sydney 38. Soon, we could see the new WNW breeze line filling under a long band of clouds (aligned SSW/NNE) as the front moved ever so agonizingly slowly onto the course area– we were about 15nm offshore at the time. We were easily one of the first dozen or so boats to get into the long awaited, very long delayed shift into the 260-280 deg quadrant. It started blowing 10-15 kts and only increased into the 12-20 kts range under certain cells moving through the course. After the frontal edge moved in for us, we could see boats only a mile or so to leeward bobbing with no wind. Taking off under barber hauled jib and later the A4, we were sailing down track at 130-145 deg to slowly sink down in front of the fleet going 8-13 kts constantly in the fairly steady breezes. The breeze was remarkably still filled with huge holes in the 8-12 kts range, puffs maxed around 18-21 kts and never lasted very long. The fleet simply disappeared behind us. Then, we were dealing with one of our crew’s deteriorating medical/ health condition (bad reaction to a sea sick patch) – so we dropped out and sailed into San Diego. A bummer for sure since we had such an amazing race going. To give you and idea how far down track we were, we got to the Pt Loma bell #3 green flasher around 9:30pm. There was only about 50nm of sailing left for us- roughly 6-7 hrs or a finish time of around 5am or so, all things considered. In short, given where we were at the time, an easy class win and possibly an overall win. In the end, we all had a great ride on Dr Laura’s new ride, a beautiful dark blue hulled boat– it has enormous potential offshore and one of these days it will get onto the winner’s podium. Dr Laura herself sailed remarkably well considering it was her first offshore race on the J/88– quite a talented and determined skipper! THE J/88 is the latest in J/Boats’ sportboat range where the full planing boats are the J/70, J/80 and J/111. They are lighter, all have carbon masts and are designed to plane in 16-18kts of wind. If you want a good IRC boat then it is the heavier, slower J/Boats which will be slightly better; the 109 and the 122 for example, but the ‘88’ buyer is bored with sailing slow, heavy boats or may come from a dinghy background, or many are coming from a bigger, raceboat background looking for more fun, less complication and less expense, writes Yachting Life boat test editor Andi Robertson. The J/88 was developed and launched in the USA and is now being built both stateside and in France. Over 50 boats have been sold so far, with 10 in Europe, off plan at the London Boat Show or from the first test sails on the Hamble. Interest is growing exponentially and five boats are coming to the UK with one due in Scotland in June. The people who are buying them include some who have looked at the J/111 and have perhaps decided that it represents a package which is too costly, while the J/88 on the water with North Sails, B&G electronics and VAT paid is around £120,000. People appear to be comparing it favourably with more expensive, bigger boats although in due course I am sure some will step up from existing sportboats as this, of course, is an excellent dayboat and family weekender as well. Key Yachting have raced their demo J/88 in the Solent Winter Series, but only with prospective buyers and different crews and they still won a few races. It proved to be most competitive diversely in the light and strong winds. In medium breezes the 29 footer might struggle against 35 footers of the same rating, which are inherently faster upwind. The J/88 will be going upwind at 6.5kts and a bit, while the 35 footer is typically 7kts. Downwind it will be quicker, but still on an upwind downwind track the longer heavier boats may be better in the 8-15kts range. However in light airs the J/88 is great and in contrast, as soon as it is planing it is even more competitive. The future is likely to be one design and already two of the UK owners are driving the class. With keen owners behind it, it will happen. And for sure the five initial sales will double quickly. The boat in one design format will be promoted actively, which is to say the intention is not to optimise to IRC, which proved a bit of a mistake with the J/111 where the mainsail girth was reduced to make it more IRC friendly. So the fleet splits between those which want to sail IRC and those on one design. All UK boats have been sold with the same sail inventory, so far all North 3Di, and the usual inventory is one mainsail, a full sized Code 2 jib, a Code 3.5 heavy weather jib, a Code 2 running spinnaker, which is a little more all purpose than the deep J/109 style running kite, and then a Code 5 reaching spinnaker. The American boats are all coming with a recessed furler as 40 of the 50 boats over there have been sold to the day sailing market. They tend to be people who have sailed for a long time, have plenty of money and have time, don’t want to race, but want a good looking, fast day boat. In Europe everybody who has ordered a boat wants it for racing. And so there is no furler and instead for those racing it is a Tuff Luff for fully crewed, or on hanks for those who will sail short handed. There will be no crew weight limit, as per the J/70. There will be a crew maximum of seven and so far the feeling is that the boat is fast and best with a crew of five or six. But overall the expectation is that the boat will be raced with a cosy mix of males, females, family teenagers, adults and there are several family crews among those who have already bought J/88s. The first Scottish buyer had a J/111 on the east coast but the boat was too fast and needed too many crew for the usual domestic racing there and so he has gone for the J/88 which is easily towed through to the west and, indeed down south for one design racing. The stern is broader than the J/92 which it replaces. 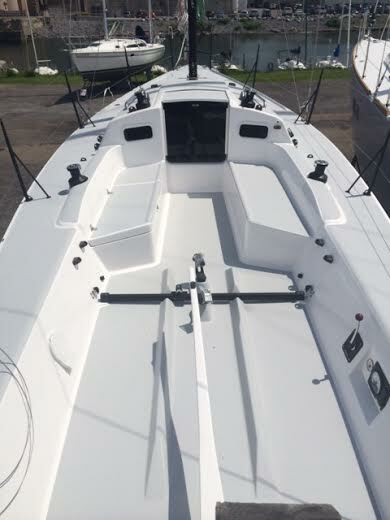 The new boats are longer on the water line, more plumb on the bow and stern, while the wider transom facilitates earlier planing and gets the crew weight outboard when you are hiking out upwind. The rudder is transom hung which gives more space in the T shaped cockpit as it allows the traveller to be further back in the cockpit. There is plenty of space for all in front of the traveller for the working crew and then behind it for the mainsheet trimmer, helm and tactician or guest. There are big moulded footrests at the back for these crew. 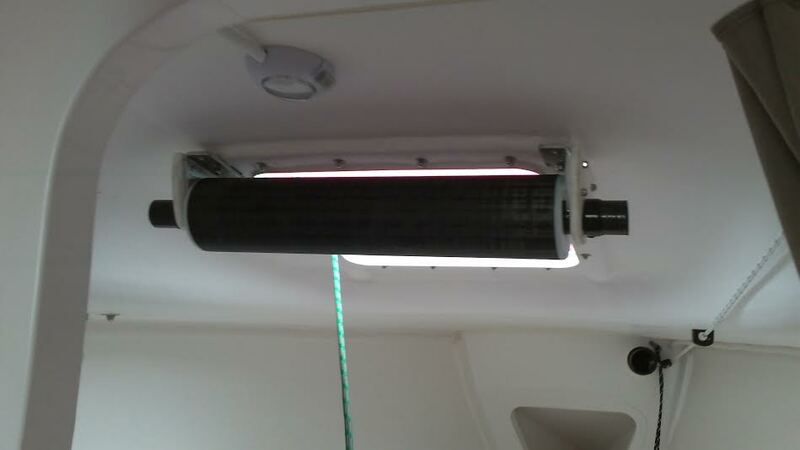 There is an excellent 18:1 fine and 6:1 coarse tune mainsheet system. The backstay and traveller controls fall easily to hand. The European boats will come with a 10hp Volvo D1 diesel with a Saildrive and two blade bronze folding prop. The lifelines are proper IRC double height with the lower lifeline lower than the mid point to facilitate hiking. Hardware will mainly be Harken on the European boats. The rig on the European boats will be Selden carbon masts, matched closely to the Hall Spars mast which is supplied on the US boats. It is deck stepped to reduce the chance of water ingress and also it restricts the overhang of the mast when it is being transported. A metre and a half off saves on overall length for ferry and transport costs. Selden have already built 130 J/70 masts and all are matched to weight and bend characteristics and CG of the US built masts. The European boats will likely lose the anchor locker up front and the furler. People over here prefer the standard jibs with normal battens for a more efficient sail shape, reflecting the fact that most will race their boats. There is more cockpit space than its predecessor and there is a good sized sliding hatch and companionway. Inside there is a V-shaped forepeak which will normally be left open for sail storage. It can have a V-berth infill which will actually create a decent sized double berth. The heads space is aft with a roll down blind available to afford a little extra privacy. There is a moulded sink to port, a little navigatorium to starboard and under the cockpit steps a big icebox for storage. The saloon area has moulded backrests offering comfort and there is the possibility to have one or two quarter berths aft. All the weight is centralised with the diesel tank behind the engine. We sailed the first UK boat in a shifty, offshore northerly breeze in Southampton water. Albeit we had a relatively tight time window, but the J/88 was impressive, especially in terms of all round speed, simplicity and handling. 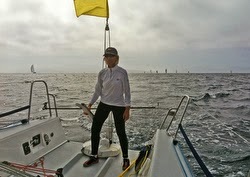 Upwind, although we only had three aboard, so one crew on the rail, it was easy to settle and find a nice, high groove. In 9-13kts of breeze we were making 6.5 to 6.7kts. Inhauling the jib gives a nice tight angle although you do have to be careful not to go too high. It felt more like a proper sportboat, with a better VMG achieved by letting the bow down and going a smidge quicker rather than necessarily sailing a high, slow mode. She tacked beautifully, swift and easy losing little way, and accelerated nicely. The foils need little encouragement, but the groove is well defined and it will not over test a reasonable helm and yet it is certainly refined enough to positively reward good crew work and steering. Off the wind? Well what’s not to like. The big running kite will have the bow lifted in 14 or 15kts of breeze and it is just the right size that it is not punishing smaller crews but it does maximise speed in light to moderate airs. And we had a blast with the reaching kite. I reckon this will be a great boat for club racing on coastal courses, like we still do all around the UK. The J/88 is a cracker. And J/Boats are probably the most successful global brand for sailing performance cruisers and sportboats. They have another winner. 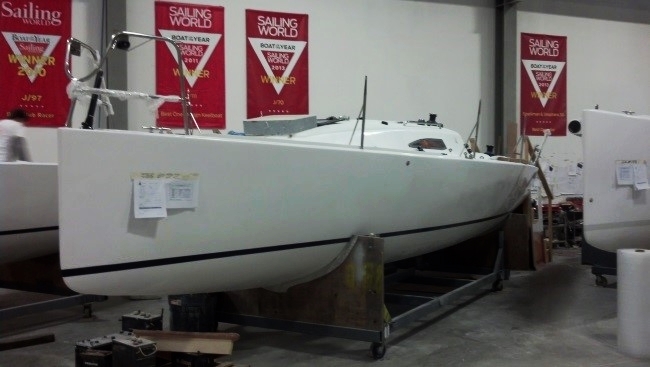 (Grevelingen, The Netherlands)- Just recently, Wessel van der Wef was incredibly excited to go sailing their new J/88. Said Wessel, “our first little regatta, first part of the day we trained some, doing boat-handling and tested the upwind speed. Then we had some training regatta together with J/92s. Finally, we where at first at the upper mark, and down wind much faster, but that is as it should be. What we learned- still a lot to learn, we need to be faster on the boat and learn all the boat-handling and get used to each other on the J/88, and get used to the J/88 itself!” Check out some of the J/88 sailing videos below. (Boston, MA)- Boston J/Dealer Hill & Lowden will be displaying the new, award-winning, J/88 at the New England Boat Show that is held along the Boston’s SE waterfront at the Convention & civic center. The J/88 will be on display from February 22nd to March 2nd at Booth# 1838. In addition, the special “SailFest” section is back bigger and better than ever! Shop more than 100 booths of sailing related products and services including sailmakers, canvas, sailboat hardware, cordage, marine electronics, rigging equipment and services, sailing schools, foul weather gear, sailing gear, clothing. There will be daily seminars for sailors and boaters, from the beginner to the advanced. World’s Hottest One-Design on Show Too- J/70! (Halifax, Nova Scotia)- Sunnybrook Yachts will be displaying the Sailing World Boat of the Year- the J/88- at the Halifax Boat Show along with the hugely popular J/70; the hottest new one design under 23'. The Halifax International Boat Show runs February 20th-23rd, 2014 at the Exhibition Park in Halifax, Nova Scotia. THE J/88 has already attracted awards from all over Europe and the USA, also sales are pleasingly steady in the UK with five boats already sold prior to the London Boat Show and at least one further boat sold during the ExCel Event. The ‘88’ fits into the line of J-Boats between the J/70 and the J/111 and is already destined to be a one design, writes Andi Robertson. With a plumb bow and negligible stern overhangs the effective waterline length is maximised. The keel shape is a modern L with a transom hung rudder. In many respects as a 30 footer it borrows from sportboat thinking in terms of layout and configuration with a short coachroof, but it feels very much like a proper yacht, hence the cockpit is big and simple with good seating forwards and there are good working areas, yet it feels secure and safe for day sailing. The generous twin spreader rig comprises a carbon mast and boom which sets a powerful main with a relatively squared off roach and with a wide shroud base uses non overlapping jibs. Standing rigging is a rod forestay, 1×19 side rigging and a Dyneema backstay. The jibs use a neatly recessed Harken furling and the mainsheet system with coarse and fine tune is well situated so that it can be easily operated by the helm if required. The rig is well set up to be easily tuned from the deck, while embracing a wide wind range. The class rules specify a maximum of two jibs and two spinnakers which ensures budgets will be kept to a sensible level. I think we can be sure that the J/88 is already on course to become a strong class in the UK with probably ten boats likely by Cowes Week or just after. One is already ordered for a Forth based Scottish J/Boat owner. According to most reports so far, the J/88 is quick in the light to moderate breezes, planes early in around 16kts and is predictably fast in the stronger breeze. It will be competitive in moderate winds, but does not have any significant speed advantages in the moderate 9-13kt range. Downstairs there is everything you would want for a bit of weekending or a few days away, or for crew to sleep comfortably aboard during regattas. There is a WC with a holding tank, positioned forward of the main bulkhead. A decent double berth up forward includes some sail stowage, whilst the main saloon includes two full length settee berths, a ‘mini galley’ and some stowage. It is simple, but basic below. It is however a good package for a 30 footer which will no doubt deliver a lot of fun, and it is a really good size. It will certainly win regattas and will be a great one design, filling an obvious gap in the market at this size. J/88 Yachts & Yachting Boat of the Year! And “Cover Girl” for Sailing World Jan/Feb issue! (Newport, RI)- Corks were popped, champagne sprayed (or drunk) and victors toasted as the 2014 Yachts & Yachting Awards were presented on Thursday, 9th of January at the London Boat Show. There was a great turnout to the event, as sailing enthusiasts gathered to celebrate the efforts and achievements of nominees and winners alike. The public had voted for winners in their droves and the readers were clearly excited about the future, and some of the most innovative new launches got the giant “thumbs-up”. Amongst those receiving awards was the J/88 family speedster, garnering the Best Performance Boat under 40ft award. Here’s Paul Heys, J/UK & Key Yachting Ltd’s Managing Director receiving the award. For more Y&Y Boat of the Year Award for J/88 family speedster. Other exciting news is that J/88 was featured as “cover art” on the beautiful new graphic design layout for Sailing World magazine- as Sailing World's Boat the Year Winner- Check it out, a nice progressive, refreshing approach for the “new media” world. 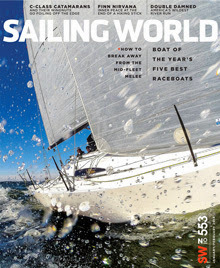 Celebrating its 50-plus years in publication, Sailing World debuted the sleek and modern new look with the release of its January/February 2014 issue. Emphasizing performance sailing’s sophisticated and technical content, the magazine’s new aesthetic features a revamped design and layout while reflecting the sport’s unique blend of cutting edge technology and classic beauty. “As many of you know, J/Boats has been updating its line of boats for the past few years. The J/111 has turned into one of the most successful offshore boats ever to sail on Lake Michigan (the Lake Michigan fleet is Fleet #1 and has 12 boats). In the last three Mac races the J/111's have placed 5 or 6 of the top 10 overall and has it's own section! The J/70 is the most successful small sportboat ever developed, selling over 350 in its first year with over 500 sold as of today. We already have 25 boats from Holland, MI to Madison, WI. The J/70 was the first boat under 25 feet J/Boats had introduced in 30 years! Now J/Boats is introducing the J/88 a fast, fun, stable, easy–to-sail (and tow) 29 footer. It has been 32 years since the J/29 was introduced, so I guess it’s about time for a boat this size again! What makes the J/88 a unique boat and appealing to everyone? It’s simple: it’s a boat perfect for a day-sail with the family, can be rigged and launched easily by two people, can be towed by a normal size vehicle, AND can be sailed in the Mac Race (speed is about the same as a J/105). The biggest surprise so far is how easy it is to tow this boat. I just finished pulling the boat from Bristol, RI to Chicago (through the Poconos Mountains in Pennsylvania) during winter storm Hercules without a problem. 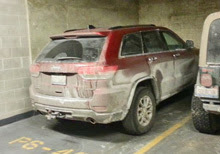 Our car is a Jeep Grand Cherokee Diesel, with a towing capacity of 7,400 lbs, it easily handled the payload (read about Richie’s amazing adventures in the J/Community section below). We will be towing to South Carolina for Charleston Race week and also plan to drive back from Mackinac with the boat. With the mast deck-stepped and on a pivot, two people can rig it, and with the single point lift the J/88 can be launched without a travel lift. The crane at Belmont should launch it easily. Towing J/88 Through Winter Storm Hercules- Inside Story! 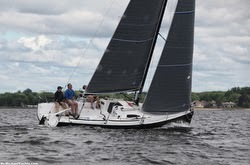 “I have been looking forward to getting the new J/88 after I sailed it last Summer. 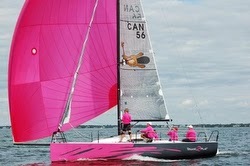 I was excited to get a boat I was hoping could be trailed behind a normal size SUV and still sail in the Mackinac race. But after looking at a bunch of cars I only found one that fit the bill. The new Jeep grand Cherokee diesel tows 7,400 pounds. But there were people that told me with a short wheelbase it wouldn't be able to pull the boat properly. So I was excited to see if my new car would actually pull this boat a 1,000 miles over mountains. I spent Christmas in Montauk New York. I had a friend drive the car to Connecticut and pick me up. We spent the night near Providence Rhode Island and the weather forecast was horrible. By the time we got to CCF C they were already closing the schools in most of Rhode Island . Winter storm Hercules was bearing down on us. The boat was ready to go at 8;00 when we got to the factory and we hooked it up to the to the car and drove the Hall spars. No sway bars just a very nice Triad trailer with surge brakes slug low so we were at 12'5" clearance. Thank goodness everything went smooth at Hall Spars and we are on the road by 10:30. It was snowing in Bristol but as you can see from the picture in front of Hall Spars (seen above) it hadn't snowed that much. And there was only an inch or 2 of accumulation. The roads were good going towards New York City . Five hours in the trip we were in the foothills of the Poconos Mountains . Now it did begin to see snow with a good wind. However the rig was just fine we could go 55 to 60 miles an hour without a problem and averaged 12 MPG. Around 3 o'clock in the afternoon the snow started to accumulate and we started seeing semi trucks that had gone over the guard rails. We stopped for about 30 minutes and got fuel and thought that maybe it let up a little bit. Back on the road it really was snowing, we drove at 45 MPH for over 2 hours but at that rate we were not getting to Chicago very fast. The salt trucks and plows were not out and the roads were now white, so we got off again, hoping the plows would come through.